It occurs very rarely in the life of a nation that the courageous spirit of one person unites all people in the celebration of his life and in the mourning of his death. Canadians wanted desperately for Terry to live to win his personal battle against the ravages of cancer. Yet it does not occur to any of us to look upon his death as a defeat or failure…we do not think of him as one who was defeated by misfortune but as one who inspired us with the example of the triumph of the human spirit over adversity. In his lifetime, Terry had captured the hearts of Canadians all across the expansive country. At a time when globalization was just an idea, Terry’s spirit touched countless numbers around the world. To this day, he is widely recognized all over the world for his extraordinary sense of purpose and the ideals of courage, determination, and altruism. Terry represented all of these things and more to millions of people. The desire to recognize and commemorate his extraordinary life and his remarkable contribution to the cause of cancer awareness and research and to his country as an outstanding citizen, athlete, and humanitarian was the impetus for the Terry Fox Humanitarian Award Program. Through the Department of Fitness and Amateur Sport and the Department of Canadian Heritage, the Government of Canada generously laid the foundation for our scholarships, respectively, through two endowments of $5 million in 1982, and another $10 million in 2006. The endowments were, and continue to be, viewed as an investment in Canadians. Our scholarships are intended to inspire and encourage young Canadians to seek the high ideal that Terry Fox exemplified, through the pursuit of higher education. In recognition of having demonstrated the highest ideals and qualities of citizenship and humanitarian service while in pursuit of excellence in academic, amateur sport, fitness, health, and voluntary community service. 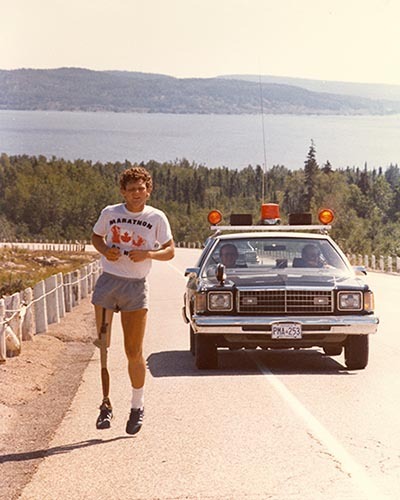 In so doing has reflected those ideals of courage, humanitarianism, service and compassion, which Terry Fox embodied. Our hope at the Terry Fox Humanitarian Program is to honour the legacy of Terry Fox by edifying and creating a spark in Canadians to continue the work that Terry started, those who not only believe in a better world but strive to contribute and, in doing so, emulate Terry Fox’s legacy.